The Gion Matsuri (Gion Festival) is one of the three major annual festivals held in Kyoto, along with the Aoi Matsuri and the Jidai Matsuri. It is officially a festival of the venerable Yasaka Shrine, located in the heart of Gion, and runs for the entire month of July. 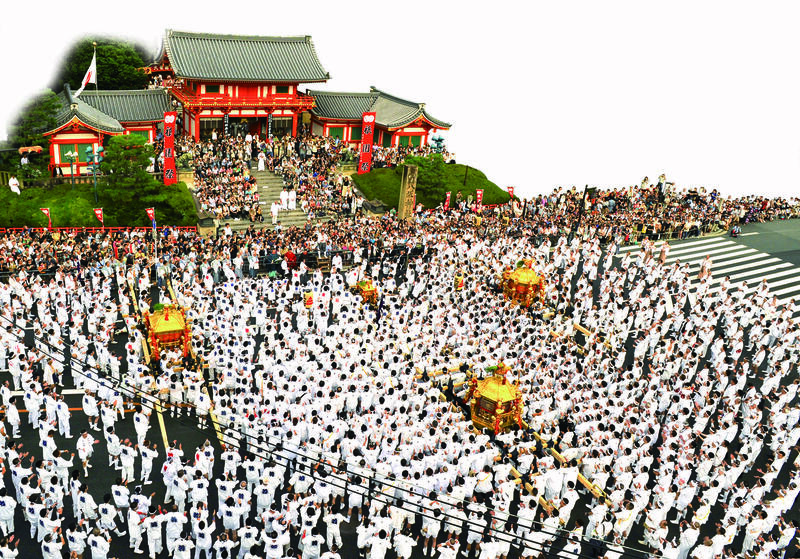 As a traditional summer event of Kyoto, is the largest and most well-known of the city’s many matsuri. In Japan, Shinto festivals begin with a ceremony welcoming and respecting the divine spirits, and end with a calming ceremony to prepare them for their return to the spirit world. 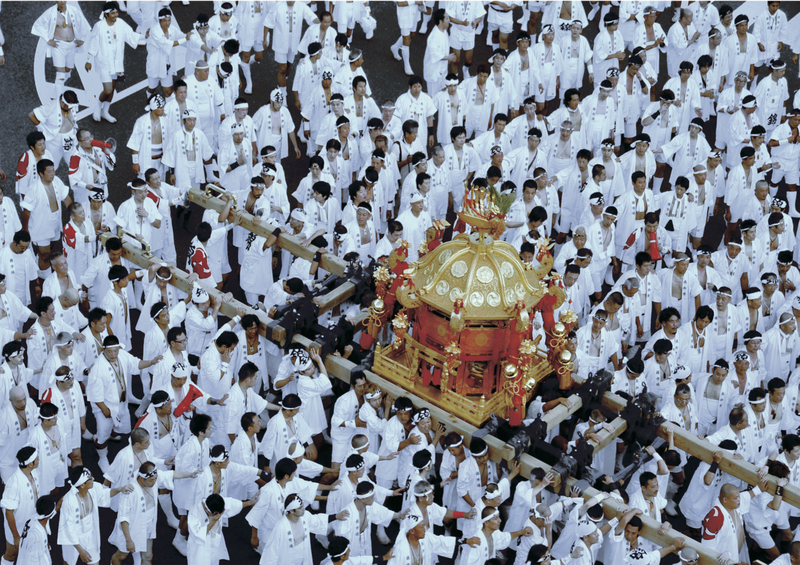 The Gion Festival follows this tradition, and the ritual of welcoming and returning the spirit is expressed through a mikoshi parade. 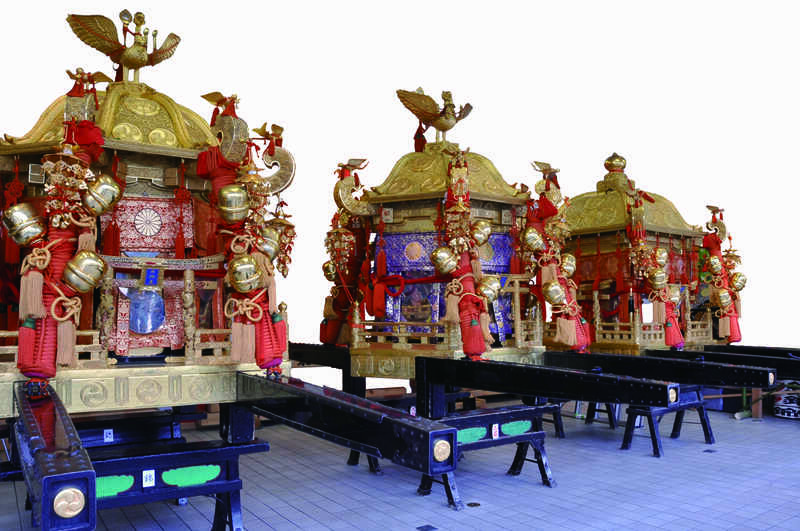 Mikoshi are portable shrines in which the divine spirits are carried. After departing from Yasaka Shrine, the Gion Festival mikoshi is carried through the neighboring streets, and after a week of visiting temporary stations prepared for it around the city, the mikoshi once again returns to its home shrine. The mikoshi-arai is a ritual held at 5 pm on two separate days during the Gion Festival: July 10th and the 28th. Basically, this is a ritual to cleanse and purify the vehicle of the gods (mikoshi), but it holds a separate significance as a way of welcoming the god of the Kamogawa river. By receiving this god of purification, the ritual is believed to purify the entire festival as well. At dusk on July 24th, after the mikoshi have spent a week in their temporary homes in the city, they are all brought back to Yasaka Shrine. On their parade back, each mikoshi covers a wider area than on the earlier Shinkōsai. 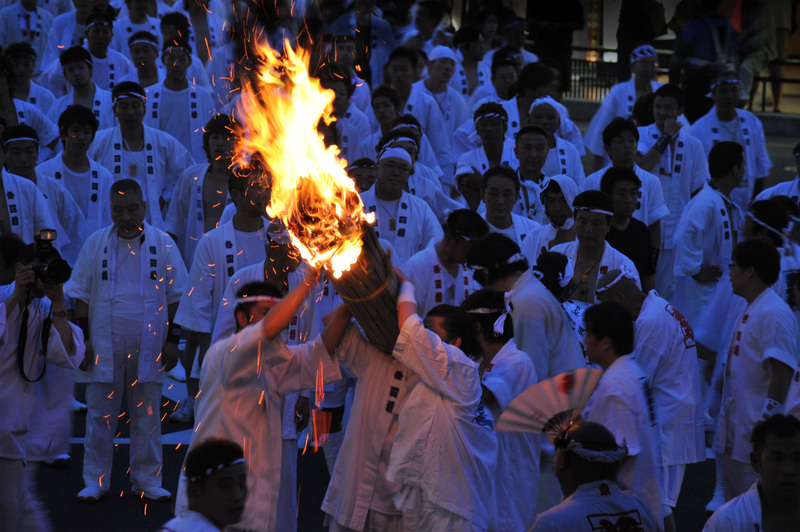 Upon return to Yasaka, they perform the climactic ritual of circling around the front shrine, called haiden-mawashi, before being set down in the shrine once more. This annual festival concludes with the ritual of mitama-utsushi, in which the spirits are transferred back into Yasaka Shrine itself. 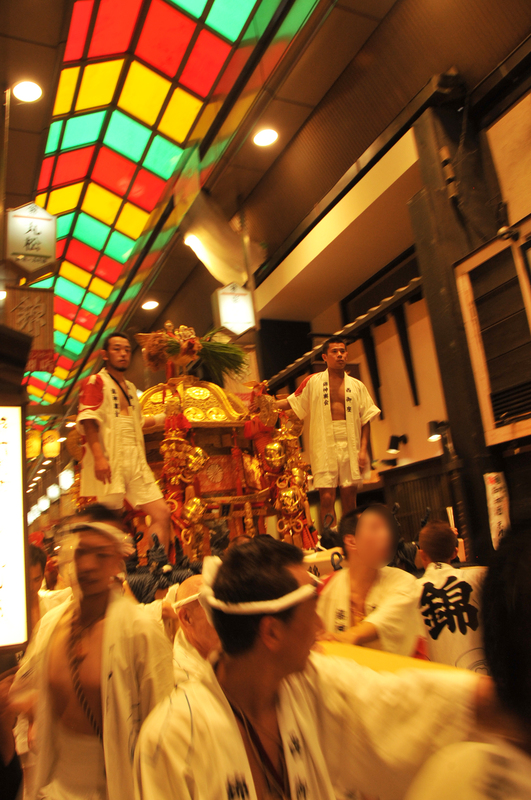 In the early evening of July 17th, the gods of Yasaka Shrine are carried in three mikoshi vehicles toward the resting places prepared for them in the city. At half past six, the three mikoshi are brought together below the stone steps of Gion to perform one of the highlight events of this festival. The people carrying these mikoshi all slip underneath, so as to raise and spin the mikoshi with all their might. Other helpers gather around to support the waists of the main mikoshi bearers as they lift these sacred vehicles toward the sky. The first spin of the mikoshi is a prayer for the gods, the second is one for themselves and their family, and the third is for all humanity. 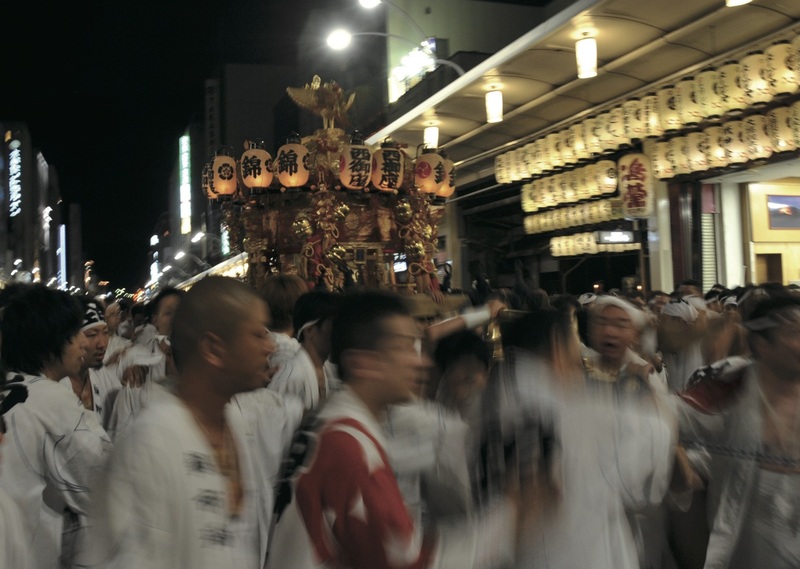 When asked to picture the Gion Festival, most Japanese will probably think of either the grand decorative parade known as the Yamaboko Junkō, or the the festive evenings of Yoiyama which leads up to it. Yamaboko Junkō was originally a holy ritual to welcome the mikoshi to the city. In Kyoto there are three associations made up of local residents- the Sanwaka-shinyokai, Shiwaka-shinyokai and Nishiki-shinyokai – each protecting their own mikoshi, respectively called the Naka-goza , Higashi-goza, (with an additional Higashiwaka-goza for children) and Nishi-goza. Each of these groups perform togyo, a mikoshi ritual to banish bad luck from the neighborhood and bring purity. The role of the mikoshi during the Gion Festival is to welcome and carry the spirit residing in Yasaka Shrine, parade through the neighborhood, and bring the spirit back. After the cleansing ceremony of Mikoshiarai, the ceremony of Shinkōsai is performed, in which the spirit is carried in the mikoshi to a temporary resting place in the city centre. This opening section of the festival, welcoming the spirit's to the city is called saki-matsuri (expressed in the Yamaboko Junkō parade), while the concluding Yamaboko Junkō parade, sending the spirit back to its original shrine, is called ato-matsuri, or Kankōsai. The power and spectacle that is a mikoshi parade comes from combining the physical strength of numerous yochō, or mikoshi bearers. For example, the Naka-goza weighs as much as 2.5 tons, and is carried by up to 700 yochō, fifty of whom shoulder the mikoshi at any given time, meaning that each yochō bears a weight of about forty kilograms. Trudging on weary feet, with calluses on their shoulders the yochō fulfill their grueling roles in this ceremony. The duty of serving as bearer of the gods is source of enormous pride for the yochō, and the iron determination of these heroes inspires all onlookers, making all who watch the yochō believe that they really are carrying a divine being on their shoulders. 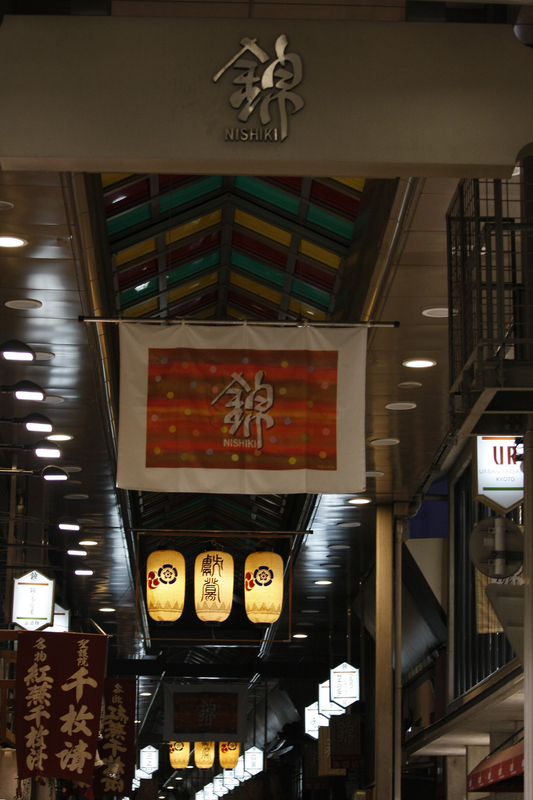 Nishiki Market (Nishiki Ichiba), famously known as “Kyoto’s Kitchen,” runs along Nishiki-koji street, from Ōmiya street in the west to Shinkyōgoku street in the east. The Street first appeared in the beginning of the 9th century during the Heian period, but it was not until 1615 that the Market was officially acknowledged by the government, designated as a fish wholesale market, responsible of of the city's seafood. After experiencing various difficulties over the years, the market has today regained its former vitality. The market itself is located in the stretch between Takakura street in the west and Teramachi street in the east. A wide variety of stores are crammed along its length, hawking everything from fish to tsukemono (Japanese pickles), tea, sweets, and vegetables. The Market is popular year-round with visitors from throughout Japan and all over the world. Of the three Gion Matsuri mikoshi, the one taken care of by the people of Nishiki Market is a little unique in that it actually belongs to the people of the Nishiki Market Association. The Nishiki-shinyokai mikoshi preservation group is administered by, but separate from, the Nishiki Market Association. This is the last group out of the three to parade during the Gion Festival, carrying the Nishi-goza mikoshi. There is also a youth association that takes part in operating the market association. The Nishi-goza mikoshi was originally protected by the renowned Shinsengumi group. After a period as a static display, considering the success of Nishiki Market, Yasaka Shrine in 1947 assigned control of the mikoshi to the Market Association. 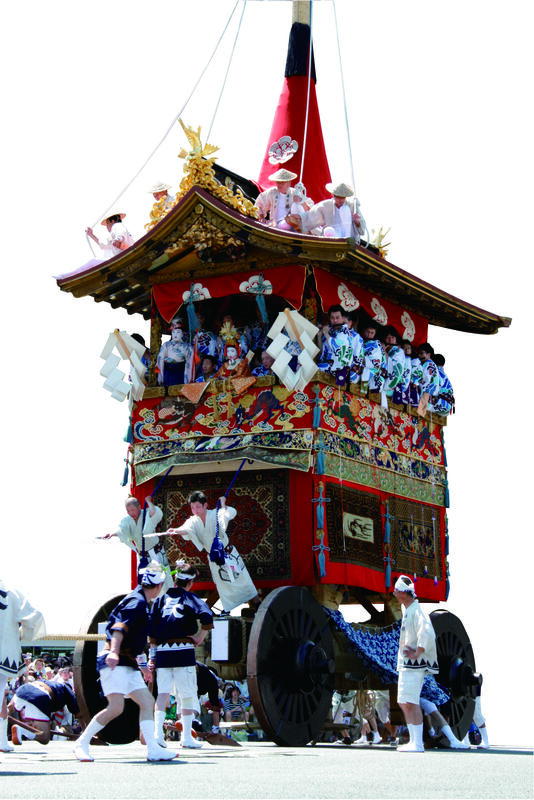 However, because the people of Nishiki had had no experience with mikoshi or parades, they had to gradually accrue this knowledge through the help of other local groups. Today, members of the Nishiki youth association are taking on a large role in supporting Nishiki-shinyokai. The youth group marks its 40th anniversary next year, in the same year as the Nishiki Market itself reaches its four hundredth. Excitement is already building in the air toward this significant year, but the mikoshi is also another motivation factor. In the three communities of Nishiki-shinyokai, Sanwaka-shinyokai, and Shiwaka-shinyokai, each mikoshi acts as a symbol bringing local people together. When members of the community come together to cooperate for the annual Gion Festival, the town gains more life and energy. This tradition is very representative of Kyoto, and it is a culture that must be continued for the future of the city. As mentioned previously, the Yamaboko Junkō parade was originally composed of two parades: welcoming and worshipping the gods during saki-matsuri, and seeing them off during ato-matsuri. In 1965 these separate events were combined into one, a format that remained for half a century. Until last year, all yamaboko floats have finished parading during saki-matsuri. So what prompted the return to a two-parade format for this year's festival? "The number of people visiting the Gion Festival has increased significantly over the years. This is why the host organizers must understand the festival correctly", says Yoshida. “For the thirty-three localities charged with protecting the Yamaboko tradition, the Gion Festival is a more sacred occasion than even the New Year. They pour a year’s worth of energy into this single midsummer event. It might be a little too much to say that a successful festival is their goal of the year, but the festival itself, as well as the Yamaboko Junkō, is definitely the fruit of the work of the people living here for generations. The Yamaboko Junkō incorporates various aspects of Japanese culture such as kadō (flower arrangement), sadō (tea ceremony), and kōdō (the way of incense), and has grown the way it has because of the townspeople, not only with their financial support, but their appreciation of such cultures as well. It is an essential part of our everyday lives, and has been for generations." "Today, members of 'old families' form less than twenty percent of our association. When I think about the future, I am convinced that our Gion Festival must be passed on to the 'newer' families living in Kyoto. This is why we have decided that we must bring it back to its original form, so as to deepen our understanding of the festival, and deliver it the way it used to be.” This year will mark the revival of the Ato-matsuri and Ōfunehoko, and will embody the spirit of the many people believing in its significance. Mr. Yoshida will lead the Yamaboko parade again this year, doing his utmost to help make a lasting impression on as many onlookers as possible. The Gion Matsuri’s signature event, the Yamaboko Junkō parade, features two distinct kinds of enormous wooden floats – 23 yama and ten hoko. There are two types of yama floats- the hikiyama (such as Iwatoyama and Kita-Kannonyama), which sit on enormous wheels and are pulled by between forty and fifty people, and wheel-less kakiyama, which are carried on the shoulders of a group in the same way as regular mikoshi. 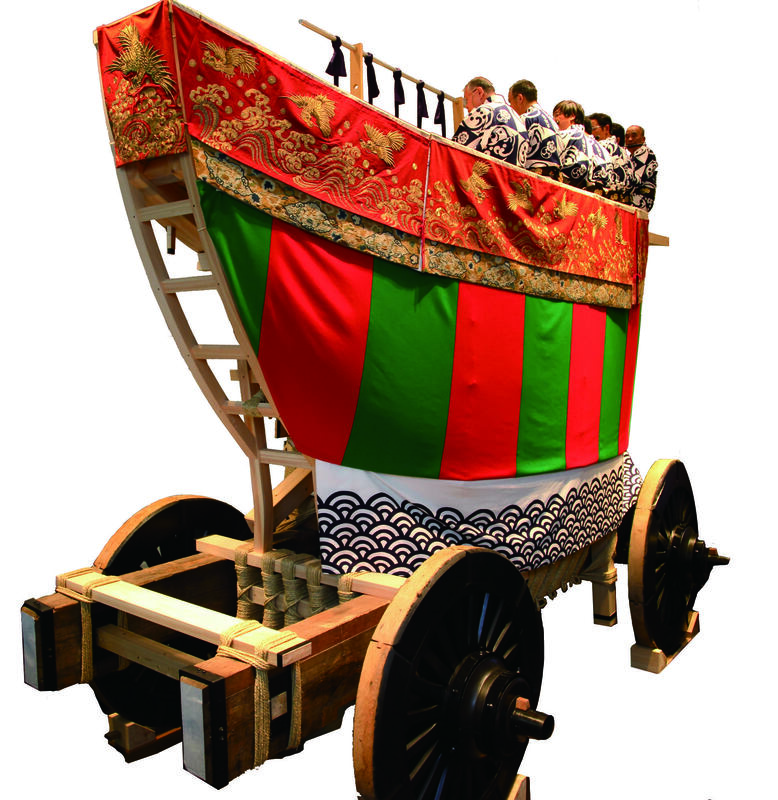 There are also two types of hoko float: those pulled along on wheels, such as Naginata-hoko, and smaller, wheel-less floats with umbrella or fan ornaments, such as Ayagasa-hoko and Shijo Kasa-hoko. With decorations such as yuzen dyed silk, Persian rugs, Belgian weavings and tapestries featuring scenes from Greek mythology, it’s no wonder the yamaboko floats are known as ‘portable museums’. In 2009, the Yamaboko Junkō was registered by UNESCO as an example of Intanglible Cultural Heritage. 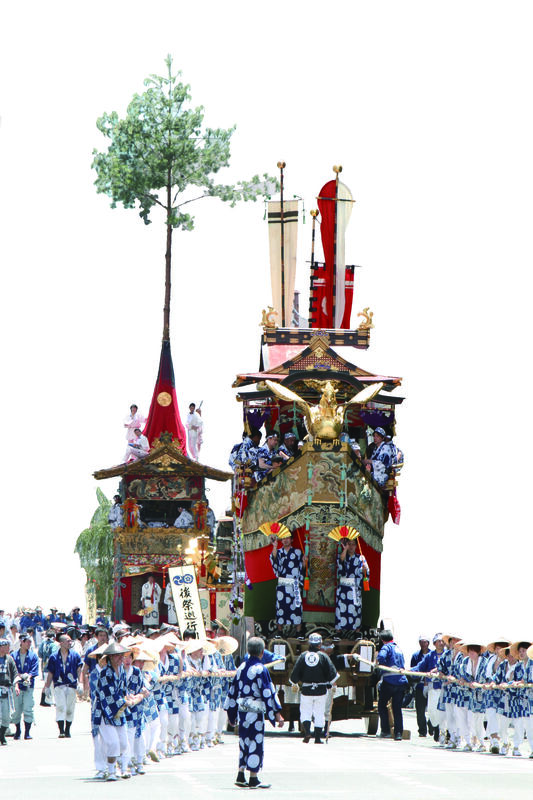 This float, which leads the saki-matsuri parade every year, is named for the enormous naginata lance mounted on its roof. 2014 marks the first appearance in 150 years of the Ofune-hoko. When destroyed in the Onin Wars of 1497 and then again in the Tenmei Fires in 1788, it was rebuilt both times and reinstated into the parade. However, ever since it was destroyed by fire a third time in the Kinmon Incident of 1864 it has been officially rested from the parade. For a time the shin tai was put on display in a local house during the Gion Matsuri, but this was suspended in 1995. Fortunately, some locals stepped forward to bring this display back, but rather than be satisfied with simply that, and have the display cancelled yet again, these ambitious locals dared to talk of a full restoration of the Ofune-hoko, for the benefit of the local community. Not caring about how many years the project would take, the group began in 2011. With financial help from the Kyoto Junior Chamber and Kyoto Lions Club, the restoration gained momentum. Thanks to their efforts, the Ofune-hoko this year makes its triumphant return to the parade. An unmistakable sound of the festival is the kon-chiki-chin of bells, flutes and drums coming from atop the hoko and yama floats. Each float has its own repertoire of up to thirty distinct melodies. On the three nights preceeding the Yamahoko Junko parade on July 17th, the streets of the downtown area are closed to traffic and lined with stalls selling food, drink, ornaments and other goods. This is Kyoto at its liveliest- thronged with visitors from Kyoto, all over Japan, and abroad. During the yoi-yama festivities, local residents associations display their priceless works of art, such as painted folding screens, hanging scrolls, and pottery in their shops and homes. It's a rare opportunity to see famous Kyoto paintings and craftwork not usually on view to the public.